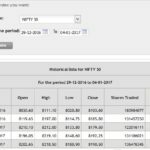 Read how trading without knowledge can take all your profits away and even your principal amount. I have read the articles in your website and all the emails that you have sent to me for the past 5 days which were very informative and educative. They were very useful and soothing also. 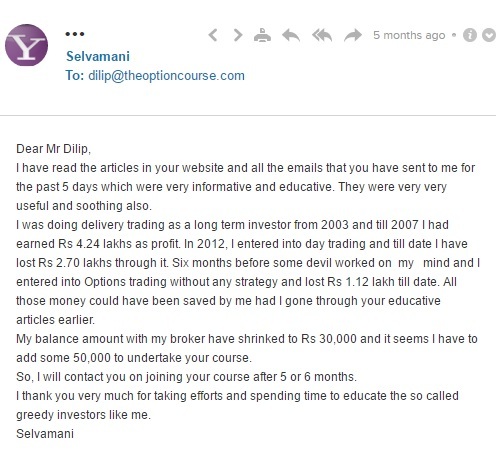 I was doing delivery trading as a long term investor from 2003 and till 2007 I had earned Rs 4.24 lakhs as profit. In 2012, I entered into day trading and till date I have lost Rs 2.70 lakhs through it. Six months before some devil worked on my mind and I entered into Options trading without any strategy and lost Rs 1.12 lakh till date. All those money could have been saved by me had I gone through your educative articles earlier. 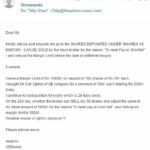 My balance amount with my broker have shrunken to Rs 30,000 and it seems I have to add some 50,000 to undertake your course. So, I will contact you on joining your course after 5 or 6 months. I thank you very much for taking efforts and spending time to educate the so called greedy investors like me. This is what happens with traders who have made money on either luck, fluke or got lucky taking tips. Over a long period of time neither luck or fluke nor tips can help you make money in stock markets or any other business. Luck and fluke are temporary, knowledge is permanent. 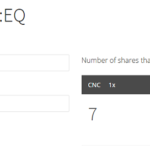 4.2 lakhs + 42. lakhs – 30000 = 8.4 lakhs – 30000 = 8.10 lakhs loss. If you have made even 1 lakh loss do my option and future trading course today. The course fee is 6% of your loss or even less. Control your loss and do the course today. You can get the payment details here.